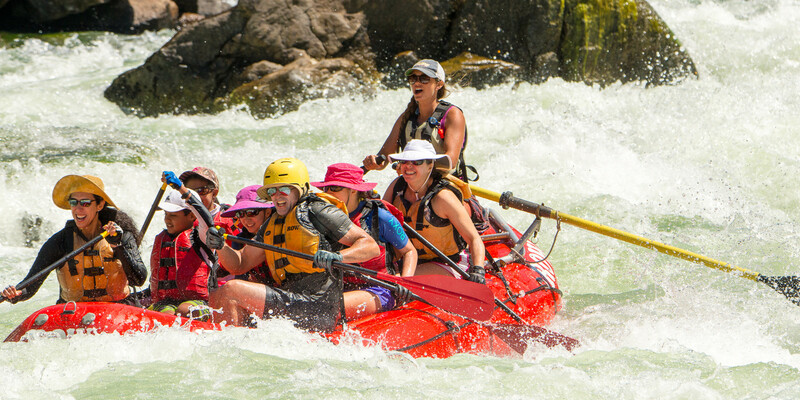 ROW offers the best family adventures and rafting trips. An outdoor family vacation creates high quality, uninterrupted time together. Turn off the cell phones (they don't work here anyway), leave behind the laptop and focus on life with your loved ones. The river constantly moves, and we've seen firsthand how sharing an adventure strengthens bonds and deepens relationships, creating what we call "Family Magic." Peter Grubb and Betsy Bowen, founders of ROW and parents of two, have carefully crafted family adventures that offer plenty of fun and activities for each family member. Without life's daily distractions getting in the way, your family will become engaged, connected and full of smiles. Many of our family adventures are family-only trips. This ensures each family will have plenty of new friends to share the experience. Please read our special letter for mothers, from Betsy Bowen. Family Magic Trips - Salmon River Canyons, Idaho: Our five-day trips on the last 51 miles of the Salmon River are idyllic escapes to a land of hot sun, warm water, huge sand beaches and fun, family-friendly whitewater. These trips are exclusively for families with rafters age five and up. Departs weekly July through August. Family Magic trips are staffed with ROW's signature, River Jester,TM who leads nature-oriented games and activities for kids of all ages. Parents and grandparents can choose to join in the fun, or spend time together comfortable knowing that their children are well-cared for by our professional staff. Our goal is to support a worry-free, healthy and supportive environment where everyone can find their voice and feel safe to share, laugh and explore. Snake River - Family Rafting in Hells Canyon: Each summer we offer several family-only and family-friendly rafting trips on the Snake River. Bordering Idaho and Oregon, the Snake boasts big rapids, spectacular scenery, superb fishing, extensive hiking trails, and an amazing richness of natural and cultural history. The Snake is Ideal for rafters age 7 and up. Clark Fork River - Montana Whitewater Day Trip: For those short on time, this single day whitewater rafting trip is a great way to spend time with your family in nature. Paddling together, you raft through a stunning canyon of purple and pink rock. Raft-tossing rapids, but plenty of time between to jump in and swim. Rafters age 5 and up are welcome. Family Canoeing Adventure - Missouri River & the Lewis and Clark Trail: Paddling the trail of Lewis and Clark along the Upper Missouri River in Montana, these canoe trips are flatwater and travel along the best-preserved section of the Lewis and Clark Historical Trail. Five days spent canoeing, hiking, exploring and learning. Most trips are accompanied by expert guest historians. Ages 5 and up are welcome. Family Adventure Camp - River Dance Lodge: Based at our Idaho Adventure Resort, River Dance Lodge, family packages combine comfortable accommodations (your own log cabin, with private hot tub) and daily activities that include rafting, kayaking, horseback riding, hiking, biking and swimming in Idaho's great outdoors. We offer 3 and 4-day all-inclusive packages. All ages welcome. Galapagos Family Vacation: (opens to our dedicated website for Galapagos) Our Galapagos trip, the only one of its kind, allows a small 12-person group to visit sites off the main tourist routes. We'll sea kayak, hike, and actually camp on the Galapagos Islands during this family adventure. ROW welcomes guests 5 and up and is happy to consider arranging a family-only departure. Peru Family Vacation: (opens to our dedicated website for Peru) There are few places on Earth that hold such an allure and mysterious ancient world as does Machu Picchu, Cusco and the Inca Trail. Tell the kids they will no longer only know this wonderful area from book and picture...ROW Adventures has a family adventure for them to experience it first-hand.